This year for Christmas, I wanted to bake and decorate all kinds of cookies. I searched and searched for all kinds of cookie cutters in the shape of different snowflakes, ornaments, trees, stockings… you name it. In the end, I only got to make and decorate snowflake cookies…so much for my grandiose ideas. I think I’ll tackle ornaments, trees, and stockings next year…and maybe snowflakes again. I realized that although I like baking and decorating cakes, I enjoy decorating cookies far more. I think it’s because each cookie is a blank canvas where you can experiment with many different colors and swirls. With a cake, you pretty much have only one big canvas with no room for error. A mistake on a cake means having to re-bake and re-frost everything., so it’s more nerve-wracking and less tranquil. With cookies, however, you bake so many that an error on one means pretty much nothing. I can also be more creative with each cookie, experimenting on colors, designs, etc., allowing me to combine designs on different cookies I like into the next cookies. The whole process is more calming and peaceful which inspires even more creativity. Instead of baking gingerbread cookies this year, I decided to make multiple batches of sugar cookie dough, adding cocoa powder to half of the batches to make chocolate sugar cookies. It worked out great because the dark color of the cookie was a nice contrast to the icing colors I created. Another new thing I tried this year was using silpats (french silicone baking mats). They…are…awesome! I’ve often struggled with getting nice even shapes for my cut-outs, but the silpats enabled me to make fragile, intricate snowflakes which would have otherwise fallen apart if I had to manually transfer the cutouts to a baking sheet. I basically rolled the cookie dough onto the silpats, used the cookie cutters to make the shapes, removed the un-used portion of the cookie dough, transfer the silpat (with cutouts) onto a baking sheet, bake the cookies, and voila! Perfect cookie shapes! I don’t know how I ever managed without them! Though I think some people use parchment paper, the silpats are re-usable and require minimal clean-up and care. Using the silpats, I was able to bake >80 chocolate and regular sugar cookies (a collection of large, medium, and small sizes). Here is an assortment using a light blue flooding with white icing outlines/decorations. I think this color combination gives the snowflakes a more refined look (compared to white flooding with light blue accents). Here is an assortment using white flooding with light blue icing outlines/decorations. Something I tried which I think worked out rather well is using ivory colored icing on a bare chocolate sugar cookie and white icing on an ivory flooded sugar cookie. I rather like the combination and plan on trying it again next year with larger stocking cutouts. The contrast of ivory and white icing on a bare chocolate cookie also works rather well. Although baking and decorating this amount of cookies was quite taxing and time consuming, I’m pretty happy with the overall results. I think I learned a lot in terms of color contrasts and want to experiment some more using dark burgundy and dark forest green colors…for the snowflakes next year! I think it will be pretty interesting as most snowflake cookies I’ve seen to date have been with white, light blue pastel colors…nothing at all stark. incredible decorating. could i just add cocoa powder to my own sugar cookie recipe to make the chocolate cookies? how much – does it matter? The amount of cocoa powder you use will depend on your batch and what color you want the final dough to look like. One thing though, I noticed the dough had a crackly appearance after re-using and re-rolling the scraps of the cutouts for the 4th or 5th time. I think it’s because the dough got drier and drier the more I re-rolled them because I kept flouring with each re-roll of the leftover scraps. Wow, I have never seen such beautful cookes. 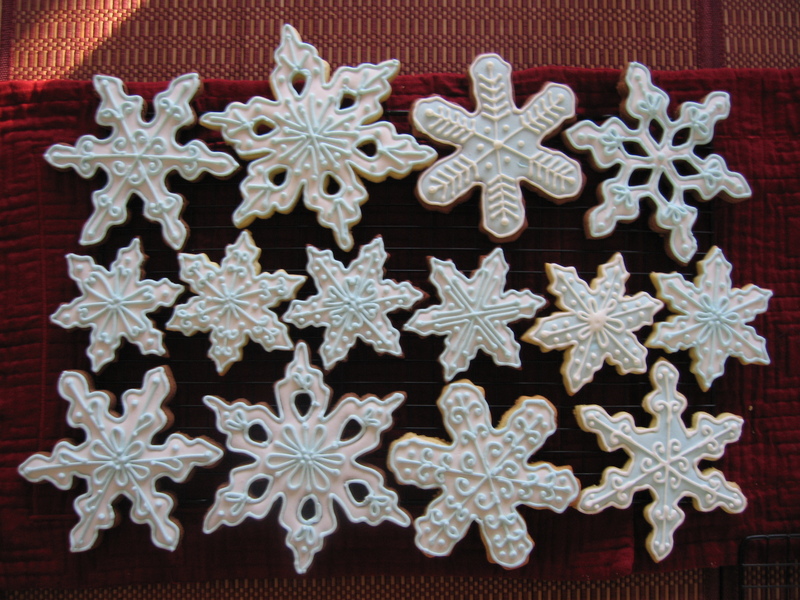 I am looking for idea to save on my daugher,s wedding which has a snowlflake theme but I couldn’t decorate cookies half as nicely you did. They are magnificant, such a shame to eat.them. Thanks! You know what? I thought the same way too, until I just tried it. It’s not as hard as it seems, just time consuming. If you are planning to do this for your daughter’s wedding, good luck and have fun! I do this every year.. about 18 Dozen … This year I will take photos. I use silver dragees from Fancy Flowers. What is your icing recipe? For my royal icing I use the old egg white & powdered sugar recipe, except I use pasteurized egg whites for salmonella concerns. If I am planning to keep them for more than a day or two, I use meringue instead of egg whites. Did you outline the cookies just one time and then flood? I agree! I absolutely love the KitchenAid mixer from my late mother-in-law. She was quite the baker extraordinaire and I’m blessed to continue her baking tradition with the mixer she gave me. Hi! Your cookies are fabulous! Where did you get your snowflake cutters??? Specifically the ones that have holes in them? I got 3 of my cookie cutters from Sur La Table (~3-4yrs ago) and it came with the small cutout cutters. I did a search and it looks like they are no longer selling them. 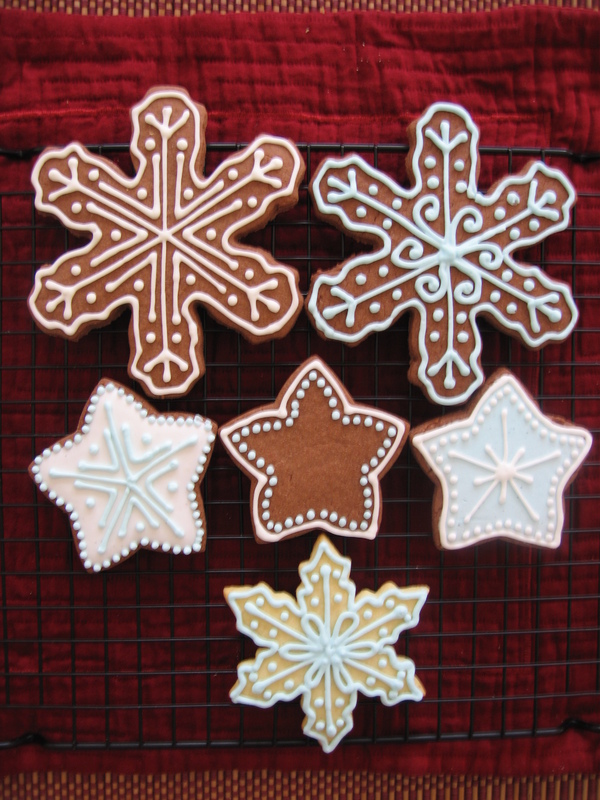 I did buy 2 more, though, and I can’t remember where I bought them, so I did a search and found the following from the Old River Road Snowflake Cookie Cutter Company offered at Amazon. It looks pretty similar to mine, but it doesn’t say if the small cutout cutters are part of it. If they aren’t, you can use the small aspic cutters (circles, diamonds, hearts, teardrops, etc.) for the cut outs. The small cutouts that came w/ my Sur La Table set are teardrop, heart, and diamond shapes. Hope this helps and happy baking and decorating! Thanks for the post! I guess my blog gets decent traffic, though it has gone down recently as I stopped posting for some time… 😦 Been a bit busy w/ work. I promote it by telling my friends and posting some of my cakes on facebook with links to my blog. I try to post something 2x a month, but I haven’t been that consistent! Gosh they’re great!!! I was wandering…where did you find the silpats??? 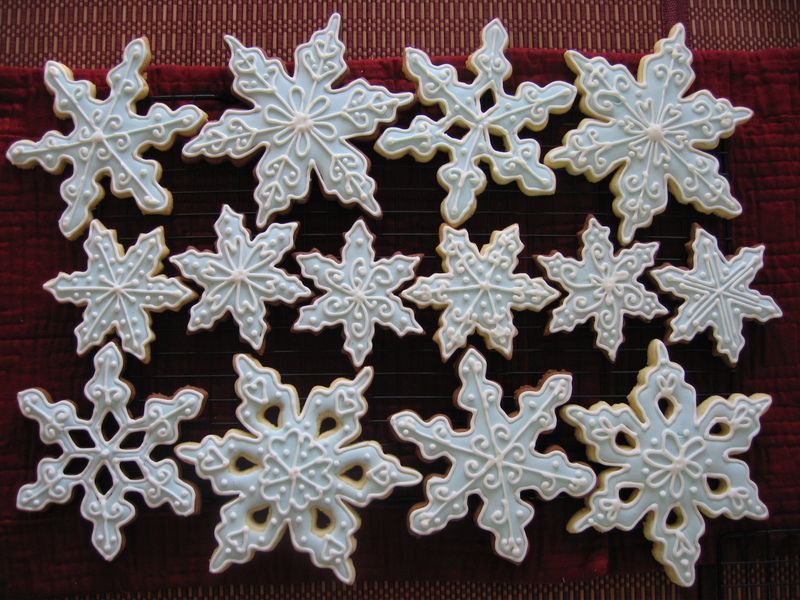 I’ve enjoyed making snowflake cookies year after year. Boy are you right about it being time consuming. I usually only manage to do a few with this much care, but I’d be interested in continuing and improving the tradition, particularly as the kids get older. My question is what cookie recipe do you use? I’ve had trouble with the cookies rising and spreading in the oven, resulting in all the cut-out holes closing up. I believe i may have read once that someone was cutting the cookies a second time whilevstill warm from the oven? I’ve tried a couple of different recipes over the years and something I’ve found is that how thin you roll the dough makes a difference. The thicker the dough, the more it will swell during baking and close up those tiny holes. 🙂 I think recipes also make a difference, so here is what I’ve been using over the years which have worked for me. Cream butter/shortening with sugar until fluffy. Add eggs and beat well. Add vanilla. Mix flour, baking powder, and salt and add to creamed mixture. Chill at least 15min. Roll on slightly floured board to 1/8″ thickness and cut into shapes. Makes about 3 dozen med-large cookies. Bake 400deg for 7-10 min. I’ve also modified this recipe by substituting 1/2 cup dutch processed cocoa powder (Hersheys) for the flour. This will make a chocolate sugar cookie. Adjust the amount of cocoa powder based on the chocolate coloring. In a mixing bowl, cream butter; gradually add sugar and beat until light and fluffy. Beat in egg. Blend in molasses and vinegar. Sift together flour, baking soda, ginger, cinnamon, cloves, and salt; gradually add to creamed mixture. Chill at least 3 hours. On well-floured surface, roll dough to 1/8″ thickness. 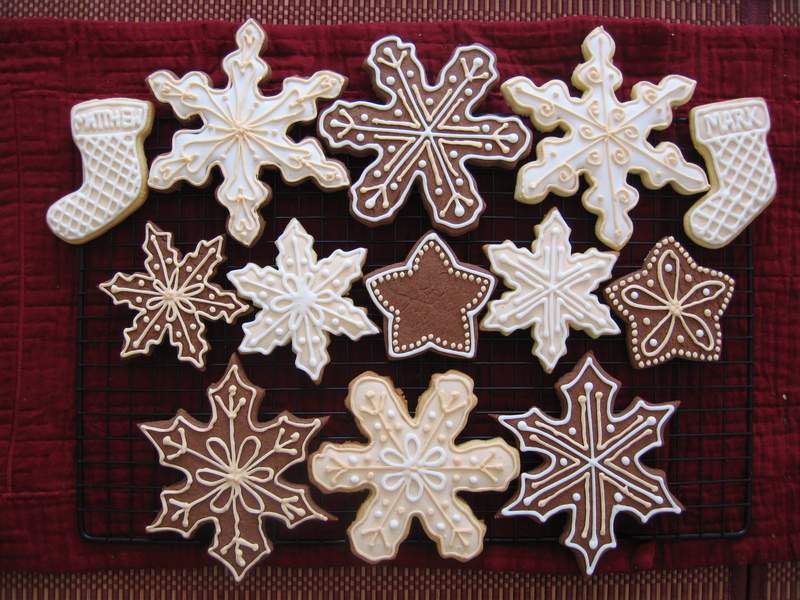 With floured cookie cutters, cut into desired shapes. With wide spatula, transfer to buttered baking sheet. Bake in preheated 375deg oven for 6-7 min. Remove immediately to wire rack to cool. Makes 6 dozen small cookies. In in a large bowl, beat butter, sugar, egg and vanilla until well blended. In another bowl, stir together flour, cocoa, baking powder, baking soda, and salt. Add to butter mixture and blend well. Refrigerate dough about 1 hour or until firm enough to roll. Preheat oven to 325deg. On lightly floured surface or parchment paper, roll out dough. Bake 5-7 min. or until no indentation remains when touched. Remove from cookie sheets; cool completely. I tripled the recipe and got about 3 dozen med-large cookies. If any of these recipes are hard to roll out because they are too sticky, then roll the dough between two sheets of parchment paper. I remember doing that, but can’t recall w/ which recipe! It says it’s a great recipe when using cookie cutters because it doesn’t spread! I guess I have to try this one at some point. Let me know how it goes if you try it! Cream sugar and butter until fluffy, about 5 min. Add eggs and flavoring. Mix dry ingredients in a separate bowl and add to butter mixture. Mix well. Put a handful of the freshly made dough in between two sheets of parchment paper and roll to desired thickness. Repeat with the rest of the dough. Put the rolled dough, including the parchment paper, on a cookie sheet and refrigerate for 10min. longer. Your dough will be chilled and read to cut and back with no wait and no added flour. Repeat with scraps after cutting cookies. Bake 350deg for 8-10min. Makes up to 8 dozen 3″ cookies. Hope this helps! Enjoy your baking and let me know how the recipes work for you!